Letterheads: Promotions on Paper, 1850s-1975 at the WHS. "...Email and texting have superseded not just letter writing but physical stationery itself. 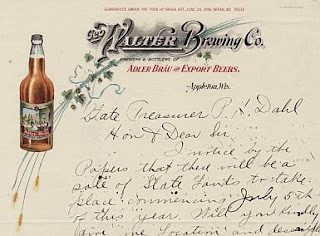 For most of the last two centuries, custom-designed letterheads were a universal way of proclaiming who you were. Historical letterheads are prime examples of early branding, as well as specimens of commercial typography and its allied printing arts. Because they're so evocative of a specific time and place, they fascinate anyone interested in advertising, local history or graphic design. This gallery features more than 300 images spanning more than a century of design, from two archival collections at the Wisconsin Historical Society." A professional letterhead design will help establish a company as an independent and professional organization. Since the majority of all official correspondence such as invoices, receipts, bills, or verification.